Egypt's Battered Tourism Industry: How Many More Hits Can It Stand? : Goats and Soda The crash last week of an EgyptAir passenger plane flying from Paris to Cairo is not likely to help Egypt's battered tourism industry. 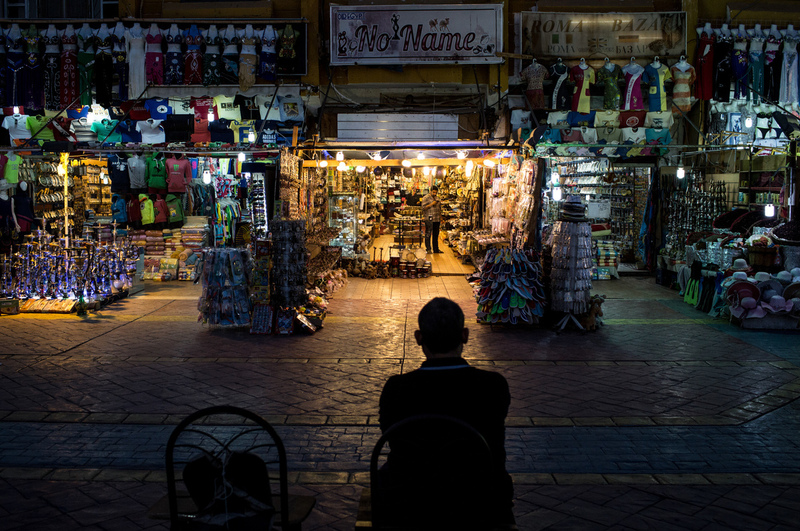 A shop owner waits for customers in a market in the resort town of Sharm el-Sheikh, Egypt. Over the past nine months, tourism has plummeted in the country after a series of deadly attacks. Khaled Ali Hassanin opens his silver minivan and pulls into Cairo's busy traffic. He is a freelance driver. He used to ferry foreign tourists all around Egypt as a staff member of a tour company. It was a great job. "There was so much work. I never worried about money. If I spent one [Egyptian] pound, I'd get two back. We had more work than we could handle," he says. Until 2011 — that's when mass protests led to the overthrow of the dictatorial Egyptian President Hosni Mubarak. Hundreds were killed. Foreign tourist visits, which had reached 14.7 million in 2010, according to government figures, dropped by 30 percent to 9.8 million. Last year the number of foreign tourists was even lower, 9.3 million. Hassanin spent savings he had accumulated during the good times to support his family — until he gave up hope on tourism. "Business dropped; the company closed down. The cars I'd drive tourists in were parked off in some garage," he says. "I have responsibilities, I have children, so I had to go find something to do." The crash last week of an EgyptAir passenger plane flying from Paris to Cairo is the latest blow to the industry, which once made up over 11 percent of Egypt's GDP. Hassanin is one of many former employees in the tourism industry who are working more in other jobs and earning less. He now competes with many other drivers who hawk rides around or outside Cairo. He earns half of what he used to and skimps on himself to pay for his family's sports club membership and English classes for his kids. Even before the 2011 revolution, bombs periodically struck high-profile tourist sites in Egypt. Adel Adrees, a tour guide for 30 years, says visits would bounce back within a few weeks, even after a fatal attack. "Before 2011, the troubles we had here in Egypt, it was internal," he says. "Nowadays the problem is regional." It is true that there are ongoing wars in the region. But Egypt has had its own special problems. In the past nine months, the military killed 12 Mexican tourists and their guide. Authorities claimed forces thought the group were Islamic militants. The body of an Italian student was found in a ditch with signs of torture, creating a public feud with Italy. A mentally ill man hijacked a plane from Cairo to Cyprus with a fake suicide belt. And a Russian jet that took off from the Egyptian resort town Sharm el-Sheikh exploded midair. Russia has suspended all flights to Egypt. But Hassan el Nahla, head of Egypt's tour guide association, brushes all these issues aside. "All this is true, but some of them are out of our hands," he says. Terrorism, he points out, happens in many countries. And while tourism isn't making the same contribution to the local economy, it still provides huge revenues. International visitors to the country's snorkeling beaches and ancient tombs brought in more than $12 billion annually in 2010. Last year, the figure had fallen to $6.6 billion. Egypt's government is starting a multimillion-dollar effort to woo back foreign visitors. Part of the money will go to boosting security and another part will go toward improving Egypt's image through international ad campaigns that highlight tourist spots. Tourism is a fragile business, many in the business in Egypt say, and the most important thing to build it up is the perception of safety. Yesterday, at Egypt's perhaps most famous attraction, Australian tourist Stephen Booker climbed backward down a ramp into the burial chamber of a small queen's pyramid at Giza. There was no line. At the pyramids of Giza, Mahmoud Tayar and his camel, Charlie Brown, are gloomy about the steep drop in tourism to Egypt over the past five years. He says the EgyptAir crash last week does not worry him. "Not for my personal safety," he says. "But I did feel sorry for the Egyptians, because they've taken one hit after another." Mahmoud Tayar knows what he means. 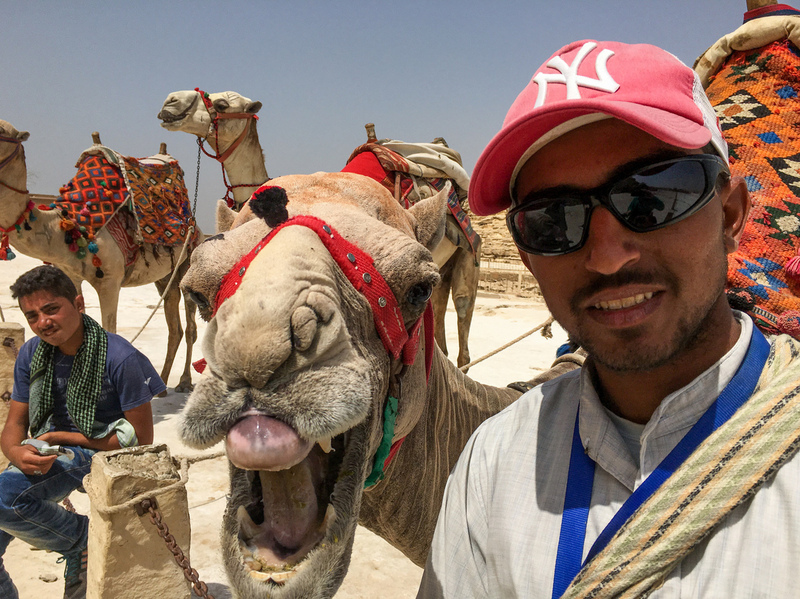 He offers camel rides to pyramid visitors. "There are a lot of camels to compete with but in good times I'd get 30 customers a day," Tayar says. "Now it's three, four, sometimes zero a day." Tayar says his camel, named Charlie Brown, feels the loss of business too. Charlie Brown, beside him, moans and bleats. "He told you 'no business,' " says Tayar, translating for his camel. " 'Busy no. No business.' "
But for visitors like Booker, that can also be a good thing. "It's certainly better for getting cheap tours, that's for sure," he says. "There's some quite cheap deals because they just aren't getting the people in."